Your single source, total solution for commercial floor coverings, Lees delivers award winning designs, superior performance and expert service. Founded in 1846, Lees has more than 150 years of experience manufacturing world-class floor coverings. Today, we are a recognized industry leader and innovator. Whether your project is for a corporate office, airport, school, convention center, healthcare facility, retail environment or hospitality center, Lees can provide the perfect carpet. Lees is one of the most respected carpet makers in America. It is widely known for combining cutting-edge design and high performance in broadloom carpets and modular carpet tiles. 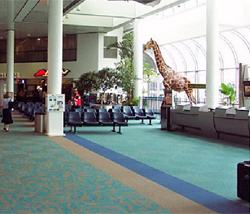 Lees carpets are found in offices, airports, hospitals, schools, hotels and other commercial installations worldwide.